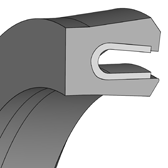 The u-ring KNA 44 is a single-acting PTFE seal in the form of an outer sealing u-ring. The steel V-spring activates the sealing lip permanently so that even in a non-pressurized state, good sealing performance is guaranteed. 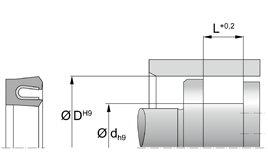 Due to the asymmetrical sealing lip, the sealing is optimised, the friction behaviour is improved and the service life considerably lengthened. The standard KNA 44 is provided in the adjoining material combination. For special applications, additional PTFE compounds and V-springs made of Elgiloy® are available.